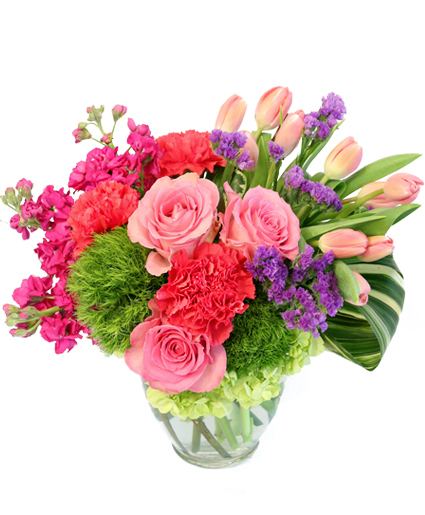 Order within 22 minutes for Same Day Delivery! 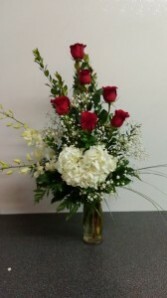 Six premium red roses with white hydrangea and white dendrobium orchids are sure to make this a winner on Valentine's day. 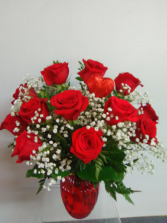 THE CLASSIC ONE DOZEN LONG STEM PREMIUM RED ROSES IN A GLASS VASE WITH assorted GREENS, WHITE FILLER FLOWERS (BABY'S BREATH). 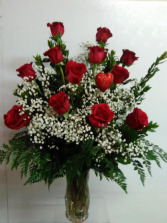 ONE DOZEN PREMIUM RED ROSES IN A RED GLASS VASE WITH ASSORTED GREENS, WHITE FILLER FLOWERS (BABY'S BREATH) AND A RED HEART.